What is Your Bailey Home Worth? Homes in Burland Ranchettes are located off Highway 285 and CR-72 with affordable mountain living on ½ to 6+ acres of sunlit pines. A variety of homes styles were built in this area ranging from 2 story, raised ranch and custom built homes accompanied by floor plans up to 4000 square feet. You will find expansive wraparound decks with serene views of wildlife and spacious mountain lots that sit at 8050 to 8750 elevation. Nature surrounds this gentle terrain with fresh mountain air. Some homesteads are horse properties with many homes containing walkout basements and 2-3 car garages. This peaceful community offers a voluntary HOA, Burland Homeowners Association. In the late 60’s homes in Burland Ranchettes were introduced and have continued to grow through the early 2000’s. Easy access to Denver, the Foothills, skiing, Pike National Forest, Staunton State Park, Wellington Lake and South Platte River. If you are looking to hit a few golf balls, it is a short drive to Red Rocks Country Club, Evergreen Golf Course and Hiwan Golf Club. Homes for sale in Burland Ranchettes offer mountain living with all the amenities close at hand! See what your home is worth With an Instant Home Valuation Online. Want advice on selling your house? We provide a free staging consultation, pre-listing prep plan, and a Burland Ranchettes real estate market analysis. Call us at 303-325-5690 to learn more. New to the Area? 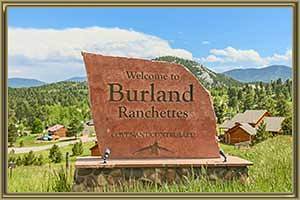 Call our Burland Ranchettes real estate agent at 303-325-5690 to schedule your tour of Homes in Bailey CO.